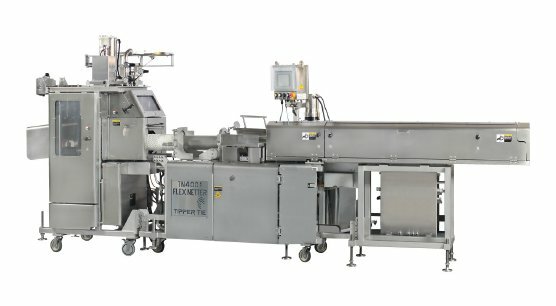 Packaging hand-placed whole muscle meats is faster and more cost-effective thanks to the TIPPER TIE TN family of automated whole muscle packaging systems. Resting on a market-tested, proven technology base, the TN4001 and TN4200 mix in some dynamic engineering features that can only be described as game-changers for meat processors. These machines were developed with an emphasis on maximizing productivity, reducing operating costs, and lowering total cost of ownership. They efficiently handle numerous applications including boneless hams, smoked meats, loins, steaks, whole muscle deli slices, and large muscle poultry. A robust stainless steel gathering-voiding-clipping system with a stationary clipper is the heart of the TN series. This is the same style device as the reliable and widely used TIPPER TIE RS clipper. It provides fast and reliable clipping and the strongest voiders available on the market, resulting in cleaner tails and a tight, secure clip closure every time. The TN family uses cutting edge servo technology to enhance many processing benefits and heighten productivity. The unique servo-powered breech of the TN4200 tightly compresses larger and longer cuts, creating more uniform product shapes and diameters. For maximum productivity, the fast acting servo-driven pushing unit provides a degree of control unachievable with pneumatic systems. This practical use of servos also eliminates the use of problematic pneumatic cylinders in the breech/pusher area. The result is lower overall maintenance costs, as well as drastically reduced energy use and noise levels. All TN machines feature intuitive controls for easy use. An advanced touch screen interface, supported by a sophisticated color guiding system, makes operation and programming simple. The operator can evaluate the machine’s performance and receive essential communications from clear screen messages and intuitive diagnostics to make troubleshooting a breeze. A powerful Recipe Manager provides immediate access to saved formulas making product changeovers quick and efficient. The critical distinctions between the TN4001 and TN4200 are speed, length of the whole muscle products each can handle, and the amount of compression achieved. The TN4001 is the first and only whole muscle system with a servo-driven pushing unit, and the TN4200 adds a servo powered breech. Three critical pusher process phases – initial push, main travel, and final push – can each be programmed to the needs of the application, their speeds and motions precisely controlled by a single operator, and continuously repeated for greater product consistency. 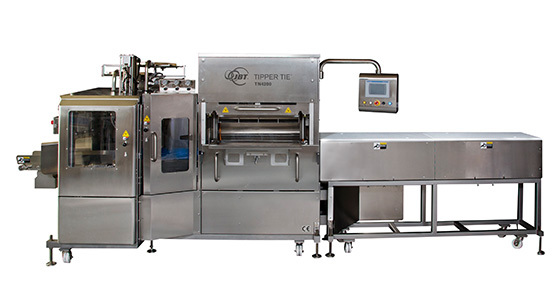 When evaluated as complete systems the combination of speed, production efficiency, low maintenance, labor savings, cost savings, and product quality improvement position the TIPPER TIE TN4000 family to become the standard in whole muscle packaging equipment systems now and for years to come. Automated compression of hand-placed meats into netting or casing. TN4001 features a servo-driven pushing unit with a 13” (330mm) power-assisted manual breech. Automated, high-powered compression of hand-placed meats into fixed diameter netting or casing. TN4200 provides maximum product uniformity for highest slicing yields.